Cloud-based platform that empowers librarians and institutions to streamline the title selection process by collecting, consolidating, and distributing usage analytics so that you can make informed business decisions. 99.98% guaranteed uptime and all data within three years available on the cloud. Customer service available 24/7 on your back-office requirements. Dynamic reporting allows you to compare trends of your readers' behavior and visualize your data in real-time. Plan for seasonal subscriptions and restrict spending to content being used based on data usage analytic indicators. Create your own personal list of e-resources cost-per-use report by searching COUNTER usage for any title online, and download the report instantly. Monthly updates and lower operational costs plus smart backup of all your data. 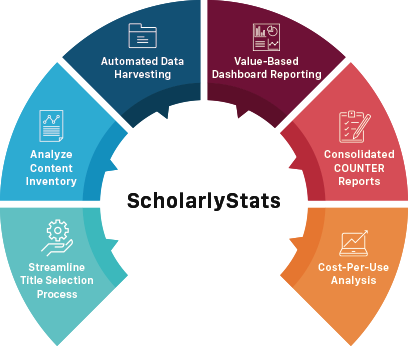 ScholarlyStats provides COUNTER standard reports at both the consortia and institution level. The intuitive user interface allows admin user to configure various institutions as a child to parent consortium. The platform integrates with various SUSHI partners. Inbuilt plugins make it convenient to provide COUNTER reports to integrated third party library system vendors. The platform provides Single Sign-On (SSO) capabilities with a customized landing page for libraries and institutions. This enables users to navigate to multiple hosting platforms without logging into different sites. ScholarlyStats provides all consolidated COUNTER reports in XLS, CSV and XML formats. All usage stats for publishers' and institutions' content you are subscribed to can be found within a COUNTER report. Available data goes back to 2005, which provides a great source for trend analysis. Accurate, consistent and compatible stats based on COUNTER standards. Stats are provided for all major categories: journals, databases, books, reference works and multimedia databases. MPS is an active member of the COUNTER technical committee. Dynamic reporting is available in COUNTER format. It allows you to fetch COUNTER reports based on provided date range. Compare title to title, ROI and more. Knowing the cost per use of each title is challenging, but essential for a librarian. ScholarlyStats provides special tools to evaluate the cost per use for any title using ISSN/ISBN search. You'll be able to identify high, low and zero ROI titles using our cost-specific dashboard. Upload your cost-in-bulk for full price-per-use reports. You'll be able to create your price-per-use report online in seconds using our search COUNTER usage feature. Receive updates on cost analysis by updated usage.